Living with a missing tooth is no laughing matter. The empty space makes it difficult to enjoy your favorite foods or feel confident when you smile. You do not need to live with the changes in your life. At DD Family Dentistry, we can help you regain a complete, functional smile using a solution that best meets your needs. 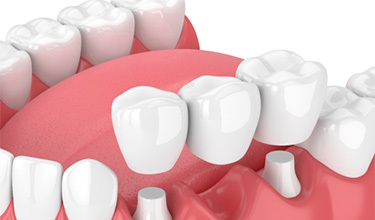 Besides a traditional bridge, we can also fill the space with a dental implant in Carrollton. Every tooth is vital to your oral health and functions. When even one is missing, serious complications occur. Not only do you lose the crown, but the root as well. The missing root causes your jawbone to deteriorate because it is no longer stimulated. Over time, your remaining teeth lose support, causing them to shift toward the open space. This leads to alignment issues that make your teeth harder to clean. Now, you have an increased risk of tooth decay and gum disease. As more time passes, you can lose more teeth because they no longer have the support they need to stay in place. You have a couple of different options to replace a lost tooth. Fixed Bridge: Also known as a crown and bridge, you can fill the empty space in your smile using an affordable and convenient solution. A prosthetic tooth is crafted to match the appearance of your natural teeth. The bridge is held in place by reshaping the adjacent teeth to allow custom-made dental crowns to be placed over them. Your bridge can last for an average of 5 years before needing to be replaced. Single Tooth Implant: Dental implants in Carrollton are a preferred option to treat tooth loss because they replace the root and the crown. A titanium biocompatible implant post is surgically placed into your jawbone to act as a new root. 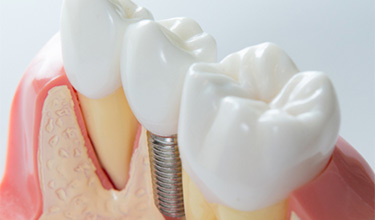 An abutment is connected to the post to attach a custom-made dental crown. Your new smile can last for several decades if you care for it properly. If you are ready to overcome the challenges of a missing tooth, your implant dentist in Carrollton can help. After performing an initial consultation to assess your oral health and discussing your desired results, a customized treatment plan is created to restore your smile. DD Family Dentistry has the solutions you need to treat your tooth loss. Do not wait. Contact our office today to start your journey to a complete smile.